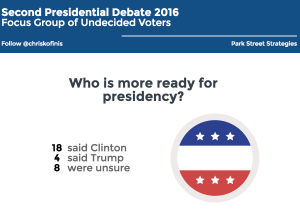 Washington, D.C.– On Sunday, October 9, a focus group of 31 undecided voters from Charlotte, North Carolina watched and dial tested the entire debate and concluded that Clinton was the clear winner. The group gave Clinton high marks for her tone and substance, while Trump’s negative tone and failure to answer questions simply turned off many of these voters. In terms of moving voters, Clinton moved 10 of these undecideds, while 4 moved toward Trump, and the rest remained undecided. 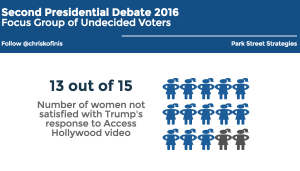 13 of 15 female respondents had a negative reaction to Trump’s response to the Access Hollywood video. Who is more ready for the presidency? 18 said Clinton, 4 Trump, and the rest were unsure. 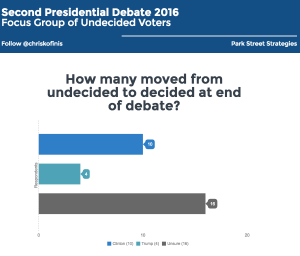 How many undecided voters changed their vote/were moved? 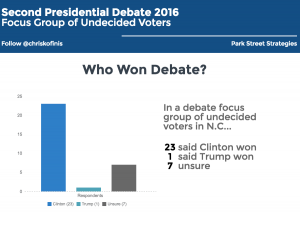 10 went from undecided to Clinton, 4 undecideds moved closer to Trump, and 16 remained unmoved. Park Street Strategies is a Washington, D.C.-based firm specializing in communications and messaging research and strategy. Our 2016 election research has been covered by CNN, MSNBC, CNBC, Washington Post, NY Times, AP, Politico, and other media outlets. Visit www.parkstreetstrategies.com for more information.